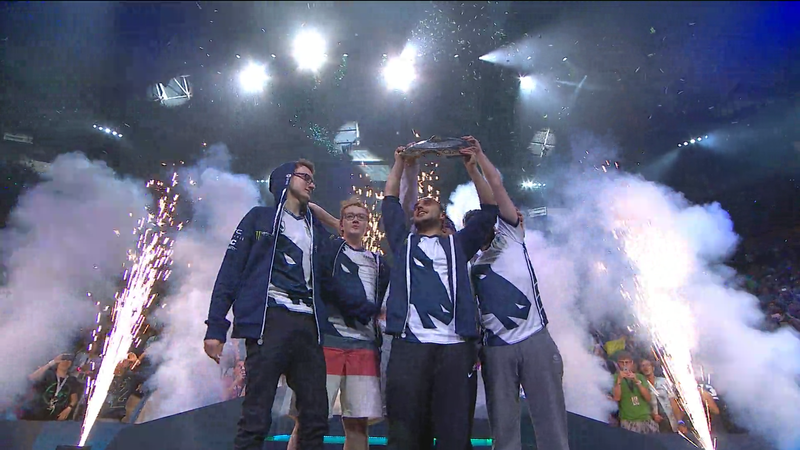 Team Liquid are the victors of The International 7, a Dota 2 tournament with over $US24 million in prize pool. The European squad will take home the lion's share at $US10,806,301 ($13,690,502) after an historic 3-0 sweep of team Newbee. Coming up through the loser's bracket, are both the first team to have ever swept the grand finals at TI, and also the first to win after dropping in the first round of the winner's bracket. After a year of strong performances and captained by seven-time International competitor Kuro "Kuroky" Takhasomi. Team Liquid, hot off a 2-1 series against LGD Forever Young, returned once again to a Nature's Prophet for Ivan "MinD_ContRoL" Borislavov Ivanov in game 1. Prophet's ability to manoeuvre around the map and pressure opponents early made Ivanov a strong presence early on, securing a series of kills and helping put Liquid up six kills in six minutes. Despite brief signs of life from Newbee, a full team wipe inside the Radiant base led to a tap-out at 27 minutes, putting Liquid up one game in the best-of-five finals. In game 2, it was Newbee's turn to take the steering wheel, especially for Song "Sccc" Chun. With Nature's Prophet finally banned out, early skirmishes kept going in Newbee's favour and Liquid became fodder, biding time for Amer "Miracle-" Al-Barkawi's Alchemist's to accumulate the items he would need to take back control of the game. Though it looked bleak, enough time was bought and Liquid broke the high ground at 29 minutes after a massive misplay from Damien "kpii" Chok, who leaped into battle and burned his ultimate on an unnoticed Linken's Sphere (an item can block single-target spells like Legion Commander's Duel). Team Liquid, coming in from the loser's bracket, closed out the match and were sitting on a 2-0 lead against Newbee, with one game between the team and a $US10 ($13) million finish. At this point, Newbee needed to stay alive, Liquid needed just one game, and beach balls of unknown origin were flooding Key Arena. Early trades back and forth set the tempo for game 3. Both teams sought the early advantage, with only a mild difference of gold separating them. Gradually, Newbee started to establish a lead, using the vision and presence of Venomancer's wards to control the map. One fight at Roshan's pit swung the lead back to Liquid, thanks to a massive Echo Slam from one of the tournament's breakout players, Maroun "GH" Merhej. Liquid secured a foothold, and despite the reviving Aegis expiring literally moments prior to a death, the Western team continued to slowly siege the Newbee base, inching ever-closer to an historic win. You know, I was looking forward to watching the international after it had happened without spoilers? Please put the winners behind a spoiler tag or something. Newspapers must be guilty of spoilers all the time after they report on a match. Perhaps going to a gaming blog after the biggest Dota 2 tournament of the year finished was a bad idea on your part? No need to go to a gaming blog, it comes up in your news feed. 'Underdog wins TI' or something along those lines would have softened the blow.